I really wanted to write a blog post today. But things were pretty crazy – I was hopping from one tunnel to another all day. Instead of writing a blog post after work tonight, I took my son out for a nice meal. Here’s a picture from my time with Aaron. I’ll make some time to add a new blog post tomorrow. 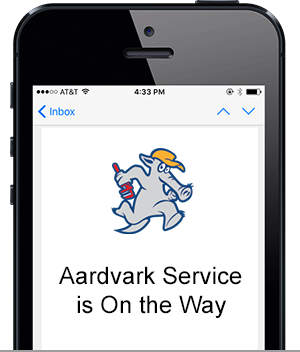 Things are going great here are Aardvark Service. It’s never been easier to dig deep to make you happy! No time to blog, though. Hope you had a fun St. Patrick’s Day. It’s a favorite at the Green house. Mr. Green here again. I have been keeping so busy running my business, that I haven’t had time to write new blog posts like I want. What I dig: Being busy. What I don’t dig: How much of a time commitment this blog has turned out to be. It’s a new year and we’ve dug out from the holidays with a renewed focus on keeping our blog up to date. Mrs. Green and the little Greens kept me busy in the past three weeks. I’ve been spending the past couple of days looking at end of year reports for our service business. Not only does this tell me that the Aardvark Squad is doing a good job on their service appointments, but it’s telling some of the new customer prospects that I’ve been sending to our website see the same thing. /wp-content/uploads/2017/11/aardvark_logo_wide-300x138-300x138.png?_t=1510935309 0 0 Mr. Green /wp-content/uploads/2017/11/aardvark_logo_wide-300x138-300x138.png?_t=1510935309 Mr. Green2016-01-03 10:11:452016-07-20 13:15:46New Year, New Blog Posts! I feel pretty bad, actually. Our old system of keeping track of our kitchen exhaust cleaning schedule on the whiteboard behind Mr. Purple’s desk (our Chief Fixing Officer) was working so great. Until it wasn’t. But it turns out that over the long Easter weekend, the entire Aardvark Service team’s favorite restaurant, Ant-y Anne’s burned to the ground. And it bugs me to say it, but it was our fault. So we started using a new field service application to help us keep track of our scheduling so nothing slips through the cracks again. We’ll also be able to prove to customers when we were there and show them before and after photos. That’s what I’m digging today. Since Easter, we’ve been stuck going to Grubby Bell, and it isn’t the same as good ole Ant-y Anne’s. We do feel bad. Welcome to the “Can you Dig it?” Blog! I’ve been doing a lot of reading about how to make our website more popular in local search results on Google. Adding new content in blog posts is one of the recommendations, so here’s our blog! Welcome to it. In each post, we’ll tell you what we’re digging. Because of all the content we’ll be adding to our blog, we’re expecting to see our search engine ranking jump to #1. /wp-content/uploads/2017/11/aardvark_logo_wide-300x138-300x138.png?_t=1510935309 0 0 Mr. Green /wp-content/uploads/2017/11/aardvark_logo_wide-300x138-300x138.png?_t=1510935309 Mr. Green2015-06-18 07:54:232016-07-20 13:57:00Welcome to the "Can you Dig it?" Blog!